I don’t like it. There are a number of reasons I don’t like it. One of the biggies is that this blurs the line between actual firearm and a training firearm. There is a company out there called Simunition that creates training firearms. 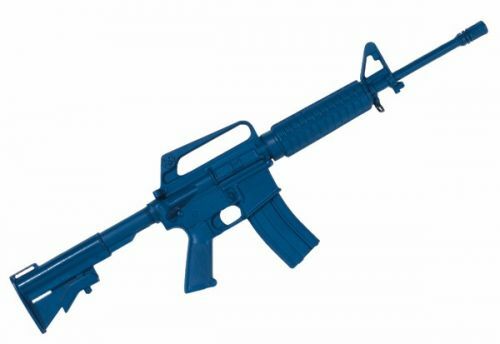 Their training firearms are nearly the exact same blue as the functioning AR-15 above. Note the blue fore-stock, barrel and bolt assembly. These are fully function, low power, training firearms designed to be used with a special type of ammuntion to simulate actually firing the weapon. It’s similar to paintball, with a real gun. Another company called Bluegun, makes solid plastic training firearms. On top of that, and I recognize that maybe, maybe I’m just an old curmudgeon, but I think a firearm should look like a firearm and a toy should look like a toy and there should be a huge Chinese wall between the two. That little orange tip on an airsoft rifle…gosh, that’s not a defeatable “safety” feature at all is it? I just don’t approve, I’m sorry. I think it is highly irresponsible to blur the lines between a firearm, a training firearm and a toy. And O.K., not pink, but blue. But there are plenty of pink guns out there too and I really have the same issues with them.